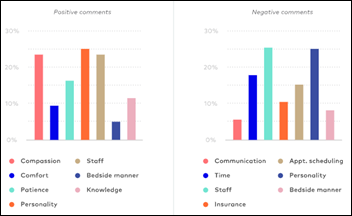 An analysis of 7 million patient reviews conducted by MGMA and Healthgrades finds that patients place the most importance on the time their physician spends with them, particularly in the areas of their willingness to answer questions, listen to concerns, and ensure patients understand their conditions or procedures. A practice’s technology offerings didn’t come up in terms of patient satisfaction, though 25 percent of reviews did mention appointment scheduling and communication, leading me to believe that practices that offer time-saving tech in these areas likely receive more positive comments than those that rely on paper-based processes. Babyscripts adds messaging capabilities for social workers and their patients in a new module aimed at helping expectant mothers in underserved areas stay healthy between OB/GYN visits. Healthfinch announces GA of its Refills Lite prescription refill management app for practices using AthenaClinicals. Chiropractic software vendor EZBIS will integrate Ability Network’s all-payer RCM application into its PM system. San Diego-based Reachify launches cloud-based software for physician practices that helps route digital communications from email, social media, and phone to relevant staff members. Co-founders Richard Balikian, MD a plastic surgeon, and Erik Stark, MD an orthopedic surgeon, provided nearly all of the company’s $2 million in early funding. Patrick Spangler (VigiLanz) and Bryan Archambault (Ghg) join OptimizeRx’s Board of Directors. FBI agents raid several CCS Oncology practices to obtain non-medical information as part of an ongoing investigation related to a late-2017 lawsuit brought by Bank of America against CCS for breach of contract. CCS defaulted on over $16.2 million in debt to the bank. The Williamsville, NY-based chain of practices, which continued to see patients during the federal site visits, has faced financial difficulties since being dropped from Independent Health’s network in 2016. 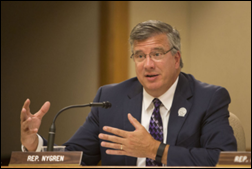 Representative John Nygren (R-WI) credits the state’s 20-percent drop in opioid prescriptions and 47-percent decrease in doctor shopping alerts to the state’s PDMP and tougher prescribing guidelines. Nygren and other members of the state’s opioid abuse task force will next look to integrate a treatment bed tracker with the PDMP – a feature that would be the first of its kind in the nation. 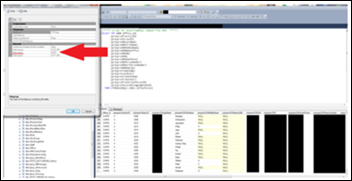 DataBreaches.net details the Herculean task it went through to alert a New York-based medical practice with no Web presence that it had left 42,000 patient records and millions of patient clinical notes exposed on a misconfigured rsync backup. Practice staff hung up on the DataBreaches investigator who called to make them aware of the situation, eventually securing the device after an affiliated health system staff member alerted them to the problem. An HHS complaint and request for investigation has since been filed. CMS Deputy CIO Janet Vogel will transition into the role of HHS CISO in April following the departure of Chris Wlaschin who is stepping down for unspecified personal reasons. Wlaschin’s resignation puts the Healthcare Cybersecurity and Communications Integration Center on even more tenuous ground given the departure of its director and removal of its deputy CISO last year. The center, which launched last June, was originally touted by Wlaschin as a resource that would “analyze [cybersecurity threats] and deliver best practices and the two or three things that a small provider, a small office, a doc in a box can do to protect his patient’s privacy and information security around those systems.” It has been mired in problems ever since, largely due to personnel issues and policy disagreements, some of which centered on the center’s almost carbon-copy resemblance to the Dept. of Homeland Security National Cybersecurity and Communications Integration Center. SRS Health adds PDMP-checking capabilities to e-prescribing workflows within its specialty-focused EHRs. 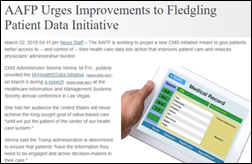 OpenEMR announces support for Web-based medical image visualization within patient records. 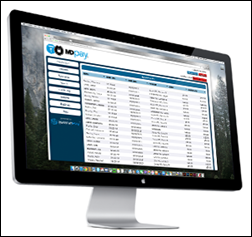 Relatient launches its MDpay digital patient billing solution after a four-month pilot that saw participating practices collect $900,000 in payments – 14 percent of which were made on a mobile device. CEO Michelle Perry joined the company last November after stints at GetWellNetwork and ThreatConnect. The local paper looks at the growing trend in healthcare appointment ride-sharing, zeroing in on Minneapolis startup Hitch Health. Its customer base includes local clinics and providers affiliated with Hennepin County Medical Center, which helped propel Hitch Health out of its affiliated Upstream Health Innovations center. Local taxi companies are upset the company has chosen to partner with Lyft for its rides; a decision made, according to co-founder Chip Truwit, MD based on data that shows Medicaid patients have a hard time booking approved taxi rides, resulting in no-shows. Dallas-based practice management company US Dermatology Partners expands to Oklahoma through the acquisitions of Stillwater Dermatology Clinic and Metcalf Dermatology. Stillwater physician Thomas Hall, MD will take on the role of USDP’s regional medical director for Oklahoma. Early April Fool’s? Foreo, “the world’s biggest beauty tech brand,” develops an emotionally intelligent toothbrush dubbed IssaAlexa that will keep users on top of both their oral health and social activities. For example, the $300 brush can detect when you’ve decided to forego brushing after a night on the town and helpfully “shout from the bathroom, ‘Alcohol enhances bad breath so I’ve cancelled your drinks with friends tomorrow.’” Foreo does indeed exist and manufacture Issa toothbrushes, though the Alexa version doesn’t seem to have hit its website yet. H/T to Politico for alerting me to 2018’s must-have beauty product. 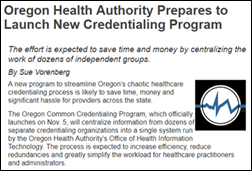 After a five-year legislative and technology selection process prompted by frustrated physicians serving in the state legislature, the Oregon Health Authority’s Office of Health Information Technology will take over the state’s credentialing program, bringing dozens of credentialing programs in house under the new Oregon Common Credentialing Program. Stakeholders selected Medversant, which runs a similar program in Washington, to handle verification, staffing, and software; and Conduent to take on help desk duties. A pilot of the new system will kick off in July, and the system is expected to fully go live in November. Fresenius Medical Care North America promotes Angela McClure to the new role of chief experience officer. 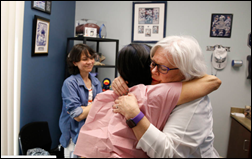 Hope Clinic, an FQHC based in Waxahachie, TX, promotes founding pediatrician Peggy Linguist, MD to CMO. Digital waiting room media company Health Media Network hires Donna Turgeon (KnowBe4) to lead its Physician Recruitment Division at new, expanded office space in Tampa, FL. 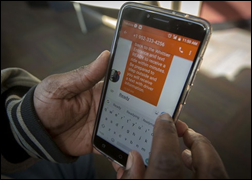 The Soldiers Project, a nonprofit provider of free mental health services for post-9/11 veterans and service members, selects messaging technology from Lua. Vanan Online Services spins out a new medical billing and coding company called Vanan Healthcare. Private equity firm LLR Partners forms practice management company Eye Health America through the acquisition of The Eye Associates (FL), Clemson Eye (SC) and Piedmont Surgery Center (SC). EHA, which will provide its clinicians with “best-in-class technology,” will be led by former Thomas Eye Group (GA) Rod Roeser. 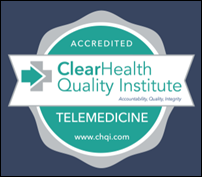 The ClearHealth Quality Institute launches a revamped telemedicine accreditation program, which it took over from the American Telemedicine Association last year. The Branson, MO-based Jesus Was Homeless ministry partners with the local health department and Cox Health system to offer low-income residents access to free virtual consults. Fitness enthusiast-focused telemedicine startup SteadyMD raises $2.5 million, bringing its total funding to $4 million since launching in 2016. Constellation Healthcare Technologies voluntarily files for Chapter 11 bankruptcy to pave the way for easier sale of its Integrated Physician Solutions PM business, and Allegiance and Orion Healthcorp RCM subsidiaries. Constellation’s NYNM IPA and management company are not included in the filings, though they will be put up for sale. The company seems to have been compelled to take Chapter 11 action after taking on debt connected to internal fraud that resulted in an executive ouster and criminal investigation. Practice Fusion’s shift to a subscription-based pricing model is likely behind the uptick in the most recent adoption numbers from EHR vendor MTBC. The Somerset, NJ-based company has seen 1,000 physicians sign up for its free TalkEHR, which launched last fall. Mental health app startup Learn to Live raises $4.3 million in a bit to attract more students, employers, and payers to its service. The Minneapolis-based company’s CEO, Dale Cook, spent several years at Deloitte Consulting before joining the company in 2012. Pharos Capital Group acquires Horizon Oncology, a four-physician practice in Indiana that will form the basis of PHG’s new Verdi Oncology clinical research and PM company. Led by new CEO Wes Chapman (PHG), Verdi Oncology will focus on buying additional oncology practices eligible for the CMS Oncology Care Model program. Denver-based Mednow Clinics sues Spectrum Health (CO) for trademark infringement related to the “MedNow” branding of its telemedicine service. The two-facility chain of clinics is seeking damages, legal fees, profits generated by MedNow (which seems pretty cheeky to me), and a halt to Spectrum’s use of the name. Primary Health Care (IA) notifies patients of a March 1 data breach involving four employee email accounts. Patient identification, health, and financial information may have been compromised, though no evidence of malicious activity has yet been found. Has it come to this? The Chicago Tribune profiles a number of companies that are developing – and monetizing – ways to incentivize people to stay off of their smartphones. The QuietCoin app, for example, rewards users with free workout classes and healthy meals at local restaurants for keeping their phones out of sight and mind. The Wyndham Grand hotel chain has taken things a step further by offering families a 5-percent discount on their stay in return for stowing their phones in special lockboxes. The local news looks at the success South Miami Children’s Clinic (FL) is having with the text-based Medici app. Medical Director Tina Carroll-Scott, MD believes that offering the app to her patients is the “natural next step for medicine.” Carroll-Scott, who conducts between 35 and 40 virtual consults during the week, says they have helped reduce ER visits and improved her relationship with patients. While the news coverage doesn’t dive into how the clinic is reimbursed for these visits, its adoption does reflect the widespread interest of physicians in virtual healthcare services, as highlighted in an MGMA poll earlier this year that found 40 percent of medical groups are currently or are planning to offer telemedicine services. A follow-up analysis finds that lack of reimbursement is the top barrier to broader adoption. Those that have integrated telemedicine into their practice routines have done so with expected ROI around increased patient satisfaction, new revenue sources, and enhanced branding. ReportingMD adds workflow-friendly EHR data retrieval capabilities from Holon Solutions to its Total Outcomes Management analytics tool. MedConnect integrates Clinigence’s quality reporting software with its EHR, PM, and billing platform for physician practices. Cleveland-based Chronic Care Management launches new behavioral health integration-focused software and services, including outcome assessment tools, care gap identification, and community resource-need matching. Chicago-based physician practice RCM vendor HealthiPass hires Imran Ahmad (OCA Ventures) as COO and Ryan Navratil (Outcome Health) as director of product. Cohen Veterans Network will open new mental health clinics for post-9/11 veterans in Orlando and San Diego this fall. Services will be available to patients across Florida and California via the network’s CVN Telehealth Services. DoseDr expands its telemedicine services to include care for chronic diseases like hypertension, coronary artery disease, chronic kidney disease, and stroke. The Baton Rouge, LA-based company will add congestive heart failure and COPD services next month. Intelligent Medical Objects promotes Matt Cardwell, PhD to chief product officer and Jose Maldonado to chief solutions officer. EClinicalWorks will exhibit at Endo Expo 2018 March 17-20 in Chicago. Healthwise announces new health educational content partnerships with GetWellNetwork, TeleHealth Services, and Mytonomy. IMO and Aorn Syntegrity partner to create a consolidated surgical scheduling procedure list.